Only two more weeks left in the semester! I’m sort of excited about it 🙂 Mostly, I’m excited for the warmer weather and all that comes with it. I’m also excited about waitressing again. As much as I love what I do as a tutor and a teacher… I don’t like sitting at a desk all day. I got a whiteboard in my room recently, so now I have an excuse to stand up every so often!! Dinner and menu planning has been somewhat of an afterthought at our house recently. Monday and Wednesday the whole family is busy.. Tuesday and Thursday Chris is coaching late… Saturday and Sunday we spend with extended family… so Friday we usually order take out!! I miss cooking… but I just don’t have much time for it lately. Not only are we too busy to eat dinner as a family… we’re also too busy to clean. My amazing husband helped me do a “baby proofing” cleaning session last night, because I was on the verge of a breakdown. I cannot function in a cluttered house. But, thanks to my hubby, it’s looking a lot better.. and I’m feeling much more sane. Landon and I make protein shakes. He likes a chocolate milk shake, and I usually make mine with coffee. Note: If your children would like to try a protein shake, check the nutrition information. The mix that I use suggests half a serving of protein powder for children under 12. I double my morning shake and drink half for lunch. I also have half a grapefruit most days with my shake. Chris makes ham and cheese sandwiches or takes leftovers. He likes to add pretzels or cashews as a snack. I pack a veggie (celery or carrots), a fruit (grapes or apple), and high protein snack (almonds, hard-boiled egg, or greek yogurt). I take my lunch early because Raegan eats lunch at 11:00 at day care, so I try to get there in time to nurse her before their lunch is over. So, I eat all of my snacks throughout the afternoon. I get really hungry in the afternoons, so I try to eat a little extra protein to keep me full until dinner. Sunday – We took my mom out because she finished grad school this week. Woo hoo! Monday – Pizza (half leftovers from Friday, half freezer pizza) and salads. Wednesday – Marinated Chicken in the crock pot. Served with rice. Saturday – My little brother’s birthday party!! I am Martha. I am busy. I am frustrated. I am overwhelmed. I have so much “on my plate” that something falls off. Something gets pushed to the “back burner”, then it boils over. I love the story of Mary and Martha, because I can see it vividly. It looks a lot like my kitchen on a weeknight after working all day. Martha is frantically cleaning while she cooks. Her sink is full of dishes and she hasn’t washed the lettuce yet. 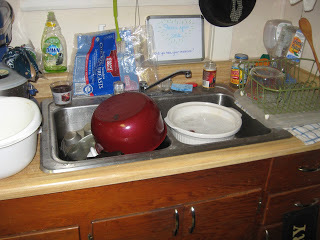 While she’s emptying the sink, just enough so the colander will fit under the faucet, the pot on the stove boils over. Where is her sister? Why hasn’t she offered to help? And what is that sticky spot on the floor? I love this story, because I find a kindred spirit in Martha. Martha is busy doing her best to serve the Lord. The scripture says, “the preparations that has to be made.” She is busy doing what she is “supposed” to do. She is busy doing what needs to be done. When I heard this story as a child in Sunday School, I didn’t understand why no one was helping Martha. Yes, I know, Mary was listening to Jesus and he is the Great Teacher. But, everyone was going to be hungry in a few hours and there would be no food if Martha didn’t cook it! Couldn’t someone help her now and they could listen together later? If Martha sat down and listened, too, what would they eat? But, none of the translations I have say that Martha was “busy”. Most often, it is translated that Martha was “distracted” by the preparations. The King James Version says that Martha was “cumbered”. I didn’t know what that meant, so I looked it up. Cumbered means hampered, hindered, or obstructed. Something was in her way. Something was blocking her. Something was taking her eyes off the true goal. The cooking and cleaning did need to be done. But, Martha let them become a distraction. Martha let the cooking and cleaning turn her heart away from her purpose. She let them make her bitter. She was serving, but not with a servant’s heart. He is the one thing I need. Stop by Misty’s blog, Simply Helping Him, to read this post. You know those things that you know you’re supposed to do.. and you know why you’re supposed to do them.. but you still don’t? For some it’s flossing. For some it’s eating vegetables. For me, it’s exercise. Taking care of my family requires that I first take care of myself. For the first few months of the year, I focused on taking care of myself spiritually. I joined a Hello Mornings group and started reading my Bible (almost) every morning. It’s a habit that everyone should try. I know, mornings aren’t prime-time for most people, but starting the day off in the Word put everything in a different perspective. Now, I need to focus on taking care of myself physically. God gave me this body, and I need to take care of it. Especially because I need to be healthy to be able to take care of these beautiful children He has blessed me with! I have been so tired since I had Raegan. I got to the point that I would pile things at the bottom of the staircase to take up in one trip before bed, because going up more often than that was too much effort. If I forgot my office keys in my car at work, and I realized half-way to my office, half-way was too far to turn around walk the “whole way” back to my car. 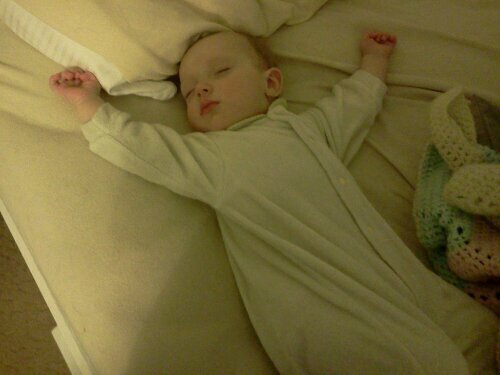 When Raegan started sleeping through the night and I was still exhausted, I couldn’t use the “newborn” excuse anymore. I am just fat and tired. “You’re not fat!” That’s so nice of you, but I am. I am not healthy. I am overweight. And, telling me that I’m not fat is not good for my health. “But you just had a baby!” I know. But she’s 9 months old now and I lost all of my “baby weight” in the first 3 weeks. This is what I weighed before I got pregnant. According to my BMI, I was just bordering on obesity before I really started to watch what I eat. A BMI of 30 constitutes obesity, and mine was 28.6. I struggled with gestational diabetes during my pregnancy as a result of my weight, and I only have a brief time period to get myself together before I’m at very high risk for Type 2 diabetes. And, I know that. I know the facts. I know the solution. I just don’t do it. I make excuses. I’m too tired. I’m okay with my appearance. My husband loves me no matter what I look like. I don’t want to buy new clothes. I can’t afford to buy new clothes!!! Enough already. I’m focused and determined to get myself back down to a healthy weight. I’ve wanted to do the Couch-to-5K program for years. Yes, years. But, I always had an excuse to put it off. Not anymore! I am done with week 1 and starting week 2! By the end of “week 1”, I was bored with the intervals and started running longer than the prescribed time. 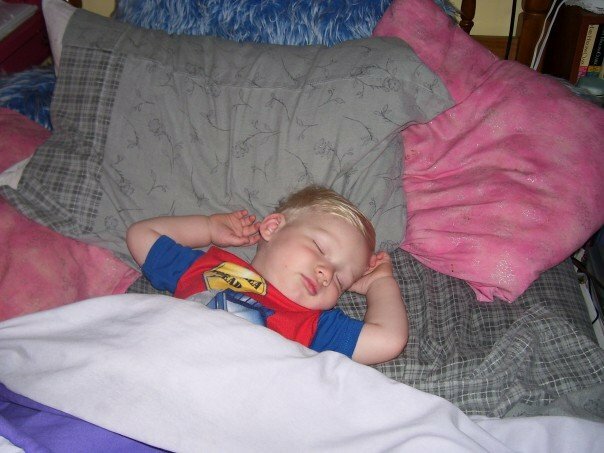 Landon slept in my bed until he was four. I didn’t mind. 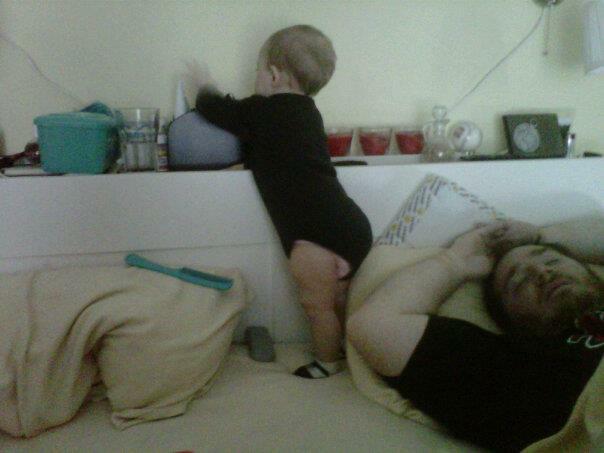 It was easier to nurse at night when we coslept…and I just got used to him being there. He always had his own bed and he knew that. When we moved to this house, he started sleeping in his own bed. I think it was the excitement of his new room. But nonetheless he slept next to me for a very long time. I was at my wits end last Thursday. 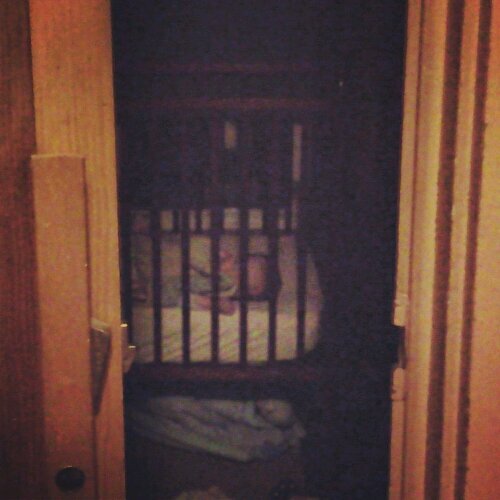 My amazing husband took the baby to her room… And I fell asleep. Then I woke up at 3 am panicked because the baby wasn’t next to me and she wasn’t crying. She was asleep in her bed. He says, “I want credit for this when you write about it on your blog.” Credit where credit is due… He’s pretty awesome. I woke her up at 6:30 to nurse. Then she went back to sleep. Too good to be true, right? Nope. We’ve been blessed beyond measure with this baby! Friday night I let her fall asleep in my bed, then I moved her to her room. Wrong. Apparently she’s fine as long add she falls asleep in her room. But if she is put there, already sleeping, she wakes up a few hours later. I’ve been putting her to bed awake every night since then and it’s been a dream. I get her up every morning to feed her and she falls back to sleep before her brother gets up for school. I’m a huge fan of cosleeping. But I think we’re both sleeping better now…especially because she doesn’t wake up to nurse at all when she’s in her room, but in my room she nursed every few hours. We still get our morning snuggle-time. I can’t believe how fast they grow!! Spring semesters are always hectic for me. It’s great that I work in the education field, like my husband, so I get holidays when my kids (and husband) are home. It’s convenient to have the summers off with them and to always have weekends free. It’s nice to get a long break over Christmas to travel and spend time with family. It’s even better that my semesters are shorter than the public school system’s so I have a few weeks to myself each semester. But, it also means that I cannot find a routine that always works for me. One thing works when everyone is in school and not when they are home. Another thing works in the fall when I’m only tutoring but not in the spring when I’m also teaching. It’s a constant battle for me to adjust to housekeeping and working and mothering and being a wife and taking care of myself all at the same time. I had a pretty nice routine established before Christmas. Yes, the house was more than a little messy, but I was more forgiving because the baby and I spent a lot of time nursing and sleeping. I’m working more than twice as many hours this semester and Chris is coaching (read: gone most nights until 7 pm or later). I’m not adjusting well. So, instead of deep cleaning and freezer cooking this year during spring break, I’m doing something a little different. I’m focusing on homemaking instead of housekeeping. I used to think they were the same. They aren’t. I struggle to keep my house clean. I am stressed and overwhelmed when my house is unkept. But, that is because my house is just a house in my eyes. A never ending chore. Decor collecting dust. Spots that need scrubbed. Carpets that need vacuumed. Piles that need decluttered. 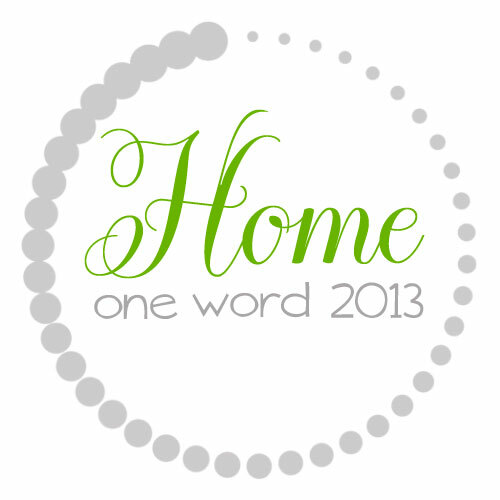 This week, I stopped housekeeping and started homemaking. I’m trying to see this place as the foundation of my family, a place where they want to come home to. I bought pretty curtains for a room we had been neglecting. We bought a new end table that opens up to hide Landon’s small toys from Raegan. 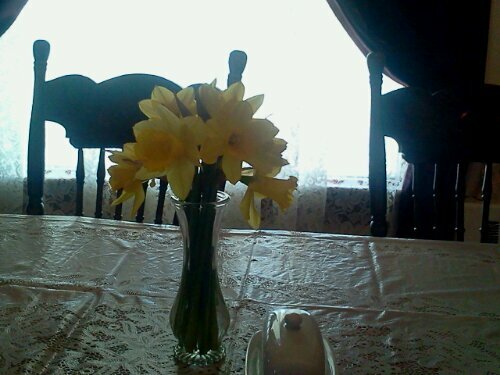 I put a fresh table cloth on the dining room table. I bought fresh flowers and put vases in several rooms. And I’m making a honey-do list that is a mile long- pulling up carpet, painting old panelling, installing vents to heat the second floor, refinishing old kitchen cabinets, moving the range, installing a new doorbell, refinishing the dining room set, enclosing the first-floor bathroom, painting the basement floor and walls, installing more lighting in the basement, installing an attic ceiling, painting all the bedrooms, rearranging the master bedroom, painting the kitchen… and on and on. Somehow in the process of decorating and rearranging my house ends up clean anyway. 🙂 and I’m more excited about the projects than stressed about the chores. For the first time, ever, I can sit in the living room with the TV off, just soaking up the sun from a nearby window and listening to the sounds of this old house. Hopefully I can keep the house at a tolerable level until May when my summer break begins. Until then posts from me will be sporadic because cooking and cleaning will be sporadic. But know that we are all well and doing our best to soak up the moments we have together as a young family. On a side note, I’m posting this from my new phone…so maybe I will be able to post more often “on the go”. I feel like I’ve been running around like a chicken with my head cut off. Running in circles and going no where… panicked and crazy. I can’t keep up with chores. I keep missing deadlines. I haven’t planned a menu for weeks. The last month has been a blur and I’m not sure why. I’ve been getting up earlier. Not that I’m getting much more accomplished, but it’s nice to not be rushed in the mornings. 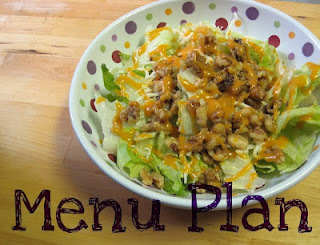 I’m giving *menu planning* another chance this week… hopefully I’ll regain some sanity.